School holidays - the only impact it has on us at the moment is that traffic is heavier, cafes are busier, and playgroup is closed. Playgroup - our happy place - our Tuesday morning ritual - our place to go and hang out with friends. It was a quiet session last week for our last day of term 3 - lovely and intimate. Kien is now playing with other children. Not so long ago they would just play alongside one another. These days they interact and talk. It is a wonderful sight to see. He also did a bit of art, although I think he was more delighted in peeling the label off the pastels than actually creating a masterpiece. Then we enjoyed the sunshine that sporadically adorned outside. We went to lunch with Rod and Grandma Gun at the Auckland Botanical Gardens, and Kien was able to have a good run around afterwards. The poppies were in full bloom; bright colours dancing in the breeze. The Prunus blossoms were beautiful. 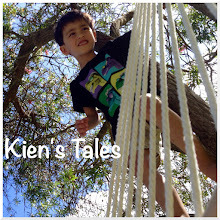 Looks like lots of fun for Kien. It's cool when they get to that age where they actually interect with other kids. Thomas likes to play with other kids but they always shove him away. There is a shop here called Rodd and Gunn (or Rod and Gun, I can't recall the spelling). Always makes me chuckle and think of grandma gun.